The RapidScat instrument that flies aboard the International Space Station measures Earth's ocean surface wind speed and direction over open waters. 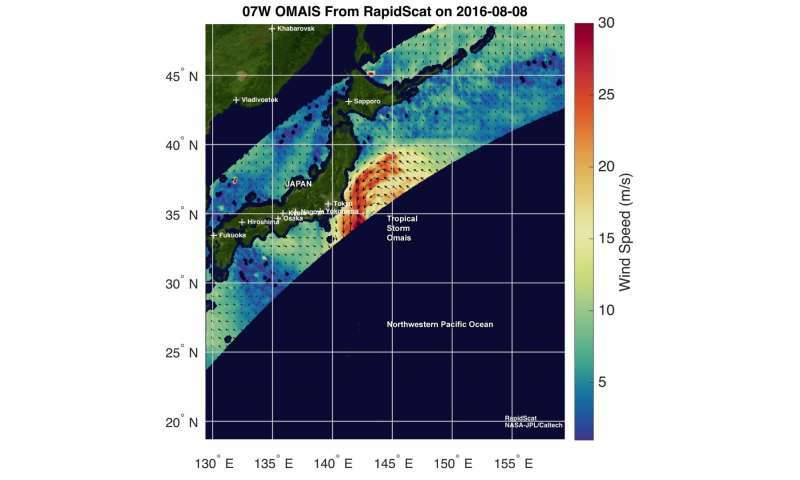 On Aug. 8 RapidScat measured surface winds on the western side of Tropical Storm Omais that were affecting central Japan. RapidScat measured maximum sustained winds between 56 mph/25 meters per second/90 kph and 67 mph (30 meters per second/108 kph). The NASA instrument arrived at the International Space Station (ISS) on Sept. 23, 2014, providing a new resource for tracking and studying storms ranging from tropical cyclones to nor'easters. The Joint Typhoon Warning Center issued their final advisory on Omais on Aug. 8 at 5 p.m. EDT (21:00 UTC). Tropical Storm Omais' maximum sustained winds dropped to 40 knots (46 mph/74 kph). Omais was centered near 37.6 degrees north latitude and 145.2 degrees east longitude, about 259 nautical miles east-northeast of Yokosuka, Japan. Omais was moving to the north-northeast and is expected to continue its life at sea. On Aug. 9, Omais was transitioning to an extra-tropical cyclone as it continues moving over cooler waters of the northwestern Pacific Ocean. When a storm becomes extra-tropical, it means that a tropical cyclone has lost its "tropical" characteristics. The National Hurricane Center defines "extra-tropical" as a transition that implies both poleward displacement (meaning it moves toward the north or south pole) of the cyclone and the conversion of the cyclone's primary energy source from the release of latent heat of condensation to baroclinic (the temperature contrast between warm and cold air masses) processes. It is important to note that cyclones can become extra-tropical and still retain winds of hurricane or tropical storm force. Omais is expected to maintain strength today, Aug. 9, as it moves through the northern Pacific Ocean.